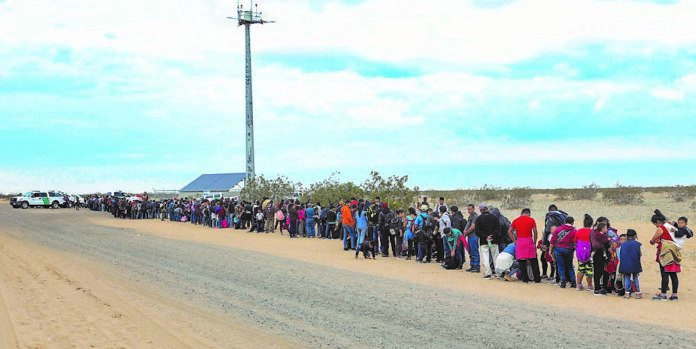 U.S. Border Patrol officials said that agents working in the Rio Grande City sector near Fronton came across 131 undocumented persons. The group was comprised of family units and unaccompanied children, who “promptly” surrendered to agents, according to a Thursday afternoon news release. At around the same time near Garciasville, agents intercepted more than 300 kilos of cocaine, but the unknown number of smugglers fled back to Mexico before agents could apprehend them, the release read. So far in fiscal year 2019, currently spanning October and November, agents on the southwest border have apprehended a total of 102,857 undocumented persons between ports of entry, 48,287 of which were family units, and 10,265 were unaccompanied minor children. Of those 48,287 family units, and 10,265 unaccompanied minor children apprehended throughout the nine sectors, nearly half of the apprehensions took place in the Valley during that same period, with 23,012 family units, and 4,627 unaccompanied minor children apprehended, according to Border Patrol statistics. This represents a more than 200-percent increase in family unit apprehensions, and a 44-percent increase in unaccompanied minor children apprehensions in the Valley compared with that same period in fiscal year 2018, when agents apprehended 7,280 family units and 3,220 unaccompanied minor children in the Valley, the agency’s website shows. El Paso shows the biggest percentage increase in the apprehension of family units during the first two months of fiscal year 2018 compared with fiscal year 2019, going from 591 family unit apprehensions in 2018, to 11,617 apprehensions in fiscal year 2019 — a more than 1,800 percent increase. Earlier this week, a group of 376 Central Americans was arrested in southwest Arizona, the vast majority of them families who dug short, shallow holes under a barrier to cross the border, authorities said Friday. The group dug under a steel barrier in seven spots about 10 miles east of a border crossing in San Luis, Arizona, and made no effort to elude immigration agents. They included 176 children.